The Stress Thermometer lets you see changes in your hand temperature, which is a reflection of your blood flow and a measure of your stress response. When you’re stressed, tiny blood vessels under your skin constrict, and the flow of blood is redirected to your major muscles and internal organs. This is why your hands feel cold when you are under stress. The blood has been rushed away from your fingers, to the more vital parts of your body because of the fight-or-flight response. Hand temperatures can range greatly, from a low of 60° to as high as 99° F. When you’re stressed, 5° changes can take place in seconds. The basic rule for interpreting your temperature change is simple, "Cold hands are tense, warm hands are relaxed." Want to learn more about how it works? Read the article "About Hand Warming Biofeedback"
Your temperature is connected to your stress level. When you are tense, the blood circulation in your hands and feet is reduced. This reduced circulation causes a drop in temperature. Relaxing increases your peripheral blood circulation, warming your hands and feet. With simple stress reduction exercises, you can increase your blood flow, raising your temperature. The Stress Thermometer lets you gauge your baseline temperature and stress level, and see moment-to-moment skin temperature changes as they relate to your stress level. Breathing from your lower diaphragm and not your upper lungs, inhale fully through your nose. Hold your breath for a moment, and exhale slowly through your mouth. Repeat, aiming for 6-12 breaths per minute. Watch your temperature increase as you relax. To consistently raise your temperature to 95°F (35°C) or higher; to hold that temperature throughout your training session. 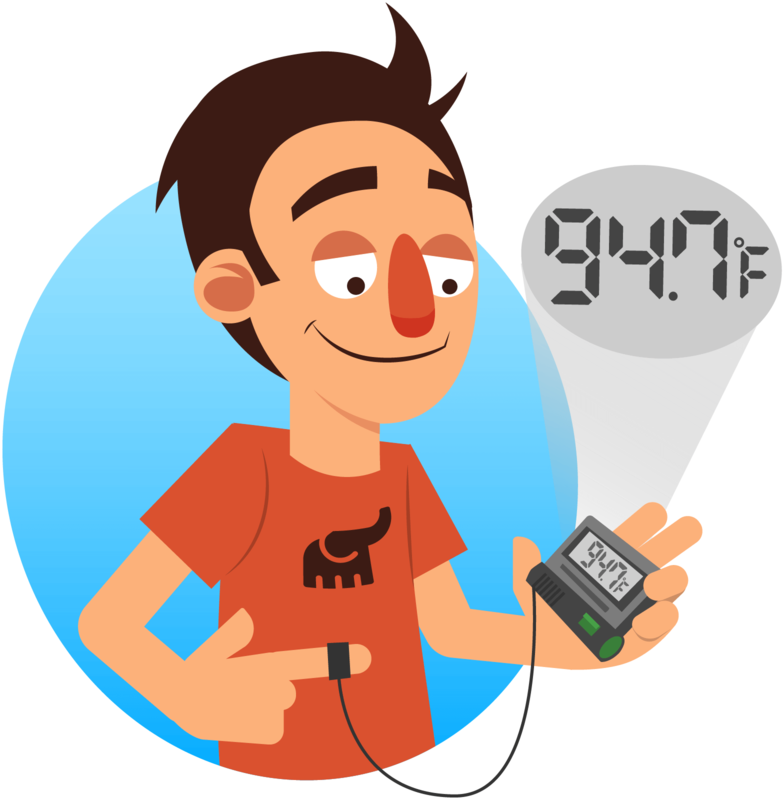 To develop the ability to recognize subtle changes in your hand temperature throughout the day, without the aid of the Stress Thermometer. To develop the skill to increase your hand temperature in the middle of stressful situations. I just want to verify that these are actually in stock and can be purchased in a quantity of one. The SC911 Digital thermometer is in stock. How do I 'turn off' the unit to preserve the battery? Do I need to remove the battery any time the unit is not in use? If so, that is poor design. There should be an on/off switch. The slide switch button on the back is at the bottom position (F Farenheit). The Green Mode switch on the front is set to Body - and without touching the probe, it is reading the room temperature constantly. I presume that is using the battery. When I change the Green Mode switch to Room, I see three bars and F on the display. Your instruction sheet says three bars means the unit is defective. If I set the switch on the back to Clock, does that disable the probe and preserve the battery? Thank you. The SC911 can not be turned off. You can set the device to the time or room temperature when the unit is set to room. We live in a very hot country. Doesn't the overall temperature affect our body temperature thereby affecting the stress thermometer? You would want to use the Stress thermometer at around normal room temperature.